These days I’m experimenting with how I feel on a low-carb, ketogenic diet. While it’s fairly different than my typical diet, I recognize that the key to my success is satisfying my sweet-tooth! 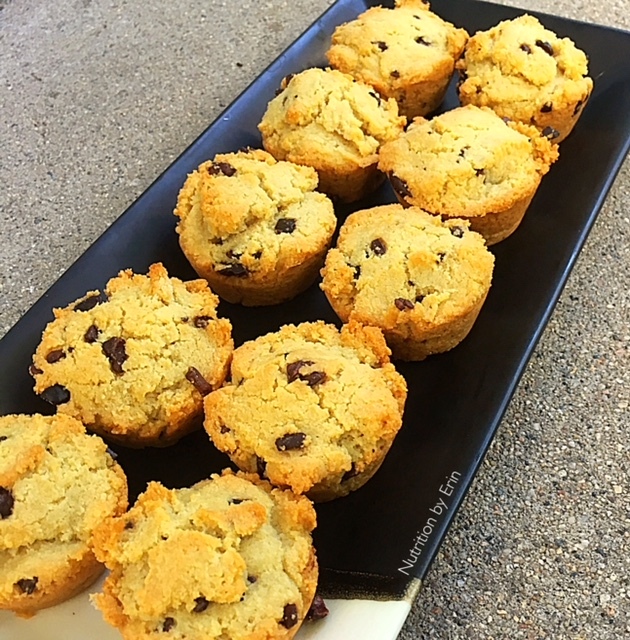 I put together this Keto Chocolate Chip Bites recipe as those cravings for dessert still kick in. This recipe is quick to throw together. I ended up baking it in a mini-muffin tin so that I would have equal serving sizes for each “bite,” but feel free to just bake them as cookies if you don’t have a mini-muffin tin. Instead of chocolate chips which can be sweetened with sugar, I used cacao nibs which only contain one gram of net-carbohydrate per 2 tablespoon serving. I used stevia drops to replace any added sweetener in the recipe. Try about 2o to 30 stevia drops depending on your preference for sweet. At 20-drops, each bite has a very slight hint of sweetness. If you’re also trying to limit carbohydrate intake or go to the full extent of ketosis, then this recipe is perfect. Each bite only contains 1.7 grams of net carbohydrates, which is the total carbohydrate grams minus the fiber grams. Dairy free-yes, but only if you replace the butter with equal amounts of coconut oil. This recipe is low lactose. This recipe makes 20 bites. Preheat your oven to 350 degrees F. Grease a baking sheet or mini-muffin tray and set aside. In a medium bowl, mix together the almond flour, cacao nibs, salt, and baking soda. In a separate bowl, mix together the butter, eggs, stevia, and vanilla extract. Combine the wet and dry ingredients and mix until dough forms. Scoop the dough onto the baking sheet or muffin tin, making about 20-bites. Bake for 11 to 13 minutes. Allow the bites to cool.